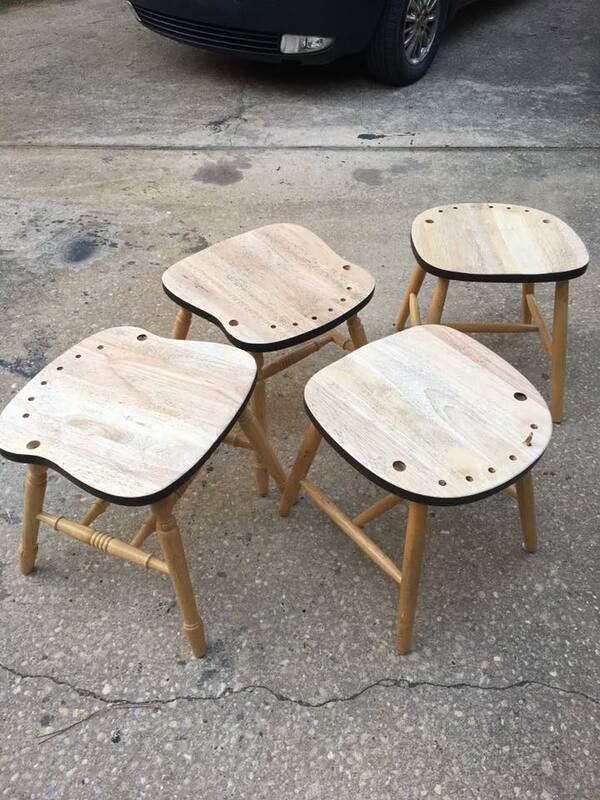 A young lady wanted to make her dining room table and chairs look like the ones she had seen on Pinterest. The ‘pin’ told her it was easy to do and could be done quickly, so she started the process by refinishing her table; a lovely dark stain on the top with white painted legs. It took the young lady three attempts to get the wood stain table close to what she wanted, and it still looked a bit uneven. As she attempted the process of refinishing the chairs, she realized she needed help decided to call me in. When I got there I noted the stain on the table top was uneven but passable, and the chair she had attempted looked a bit messy with an uneven stain pattern plus some very deep sanding scratches. I see this from time to time, someone will tell you they saw something on; pick one – Facebook, YouTube, Instagram etc. … and that the project not only looked great it was “easy-peasy” too!, not realizing that the person who posted the result was either a semi-professional, someone getting paid via AdSense for their internet postings, or a photographer that took my grandma’s advice and remembered to put the burnt side of the biscuits down. After many years you would think people would learn, it’s never as easy as it looks in the pictures. So how should you really refinish chairs? First off, if you plan to stain any part of the wood you must get all the old finish off, every bit of it because if you leave any finish the stain won’t penetrate and you will get a blotchy finish. The best way to remove finish is with a chemical stripper and you can find several brands of “green” finish stripper at your favorite big box store. By the way, even if it is “green” that doesn’t mean you don’t need to follow the directions for personal protection. Read and head the label. After chemical stripping you need to wash the stripper off with clean water. I’ve used tap water from a hose and recently tried a pressure washer. The theory was the pressure washer would lift the finish with the stripper but that didn’t work for this project. Instead I went to my trusty cabinet scraper which made short work of the old finish after the stripper had done its job. However, the pressure wash did ensure that the residue from the stripper was removed from the pours of the wood. Next, in order to remove any scratches you need to sand. The big box stores consider 120 and then 220 grit paper to be good enough and I suppose it is if you plan to paint the whole thing but not if you plan to stain. Especially with the typical soft woods that modern chairs from South East Asia seem to be made of. With soft wood you have to take two more steps up, 320 grit and then 0000 steel wool. Now with all this sanding you might wonder about how to get between the spindles that form the chair back? The only effective answer is to remove them. That’s right you need to disassemble the chair! Don’t worry this part can be fun. Most likely the chair was glued with a PVA glue (that’s the big brother to white glue). 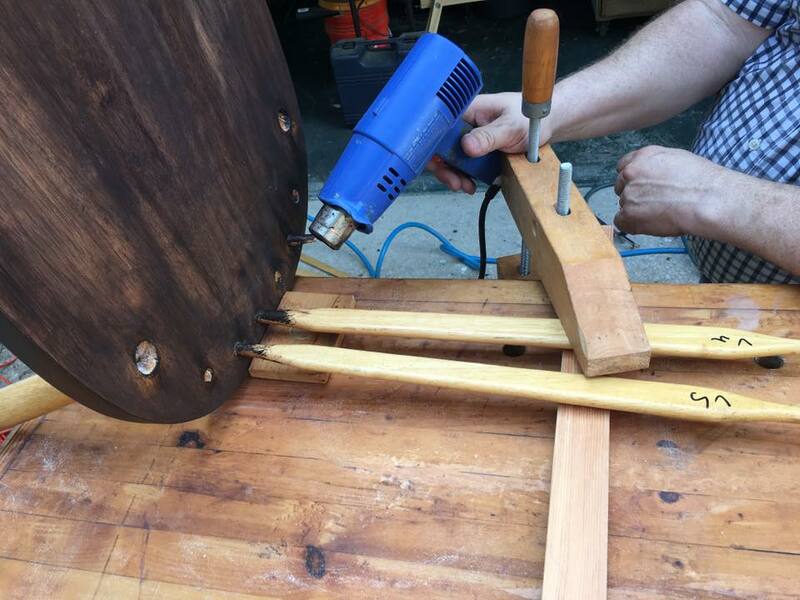 If you are lucky the glue may have dried out and you can unscrew, wiggle and/or tap the chair back free from the seat, if not then you need a glue solvent, start with white vinegar soaked into a rag wrapped around the joint overnight. If that doesn’t work then try a heat gun being careful not to burn the wood. If that’s not working then the next steps must be accomplished in a well ventilated area with the appropriate personal protection – gloves, glasses, respirator; move on to denatured alcohol which is next of the list (not to be used with the heat gun, alcohol is flammable). Still not coming apart? Try Acetone and then Xylitol (a very strong benzene solvent). Finally, if all else fails – which it usually does if the glue and the joint are of good quality – then put the chair up on the workbench and use a vice to pull the joints apart while heating it again. CAUTION: do not try to twist the joint apart! Wood fibers are incredibly strong in compression and tension but prone to failure when twisted or bent. Having a part of the wood joint stuck in the chair seat is not fun. Once the chair is apart you can do an effective job sanding out the scratches and other distress that happens to chairs over time. However, you are still not ready to stain, you have probably noticed by this time that the chair seat was not make up from a single board but from several boards. These boards probably have their grain running in all directions which will make some of the boards softer or harder than others. So prep the surface with a “sanding sealer”, either store bought or a 20% solution of shellac diluted with denatured alcohol. The sealer will dry very quickly but will toughen up the soft spots. Then another go with 0000 steel wool and you are ready to stain. Follow the directions on the product you have selected. My personal preference leans toward Varathane wood finish which is a Rust-Oleum brand of stain and polyurethane. The rule of thumb for stains and finishes is to stick with the same brand for both, so if you like Minwax then use both their stain and varnish, don’t mix the brands as they are usually formulated to work together. I always wait at least three days between applying the stain and starting the finishing process. Once the seat was stained to liking I got to work on the rest of the parts to be painted white. Granted you could just paint over the old finish but if you want it to stick you need to again strip the finish. Use the same chemical strip and rinse procedure you used earlier but you don’t need to be as diligent with the sanding, just enough to remove any deep scratches or distress marks. The instruction on the can will probably say apply with a brush or roller which will leave orange peel or brush marks and if that’s the look you want then go for it. My preference is to hang the pieces and then dilute the paint enough so it can be sprayed with a 4oz gun. Make light passes and take your time so you don’t have to deal with runs and drips. Now wait another three days for everything to dry completely and reassemble. Yes, I could use PVA glue during reassembly, but remembering the problems we had taking it apart maybe I want to go with tightbond hide glue, works a lot like hot hide glue in that it can be reversed with heat. Sounds good to me if I ever have to work on these chairs again. One last thought, instead of removing the old finish why didn’t we go with gel stain? Well the table had already been done so using gel stand on the chairs would have looked very different as the color choices were not the same. Also, if you want the stain to really stick and some the wood texture to show through then you still need to break the old finish before applying the gel. You don’t have to be as diligent about removing the finish, about the same amount of effort as when you prep the surface for accepting paint. Scratches will still show up with gel stain although you can finger paint with gel stain so maybe you could hide the scratch with a clever application. Gel stain needs 3-4 coats to get an even look and each coat requires 24 hours to dry, so plan accordingly. Granted I’ve seen people use gel stain to make metal look like wood so it’s got good adhesion properties and with the correct technique you can develop your own grain pattern across the seat bottom. Like anything the correct effect with gel stain is a matter of practice. As said before, since the project was already I progress the standard staining process won the day. In closing, next time someone says it’s easy don’t believe them! Often self-trained people develop their skill to a professional level and don’t realize they are professional grade, their years of experience and volume of projects has made them much better than they realize. If that’s where you want to be then go ahead with your project, just be ready to learn from your experience and be willing to restart several times, such is the cost of your education.